Following yesterday’s Ankara tragedy in which a 22-year-old Turkish off-duty police officers assassinated the Russian ambassador, Turkey found itself in a scapegoat vacuum, having nobody to blame: after all, following this summer’s failed “coup”, Erdogan allegedly purged all forces who were hostile to his administration, which would suggest the police officer was one of “Erdogan’s people.” That however quickly changed when this morning Turkey’s pro-government media outlets and journalists promptly cast the blame for the cold-blooded murder on the US, and the faith-based Gulen movement whose cleric Fetullah Gulen has been granted refuge in rural Pennsylvania, for the murder of the Russian ambassador to Turkey by a police officer on Monday evening. 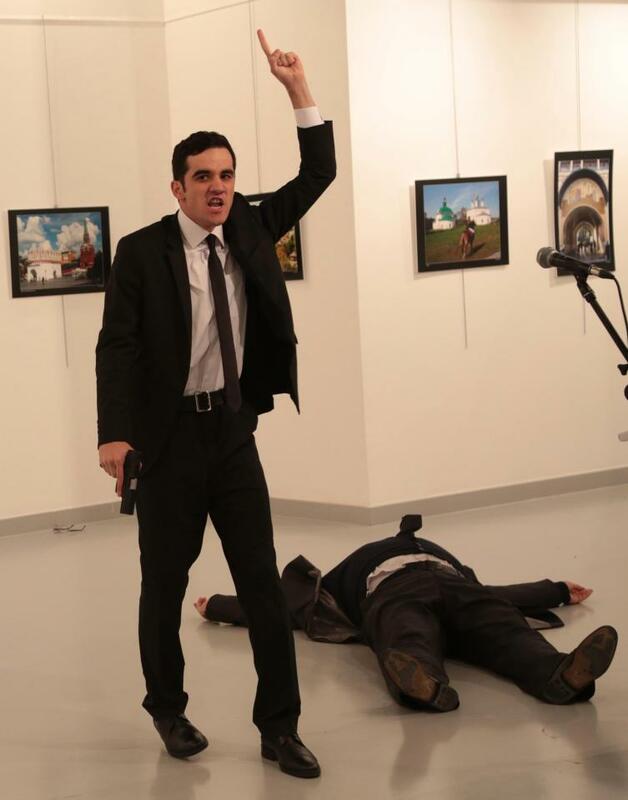 The gunman, Mevlut Mert Altintas, chanted Islamist slogans also used by radical terrorist organization the Al Nusra Front after he shot Karlov to death at an art gallery in Ankara. Yet, many pro-government newspapers and columnists did not hesitate to label the gunman a member of “FETÖ,” a term the government coined to call the Gulen movement a terrorist organization, and also talked about the US role in the murder from their front pages on Tuesday. The pro-government Yeni Safak newspaper announced the murder of the ambassador with a headline saying, “Great sabotage.” The daily said “The pro-FETÖ assassins of the CIA have been mobilized” in order to ruin Turkish-Russian relations. “It is stated that the US has begun open attacks [against Turkey] over FETÖ,” said the daily. Another pro-government newspaper, the Sabah daily, blasted “Assassination to friendship from vile FETÖ,” in the headline of its main story on Tuesday. The daily said dirty hands took action at a time when relations between Turkey and Russia have begun to normalize. A third staunchly pro-government daily, Star, said in the headline of its main story on Tuesday: “Bullet from FETÖ to Turkish-Russian relations.” The same exact headline was also used by the pro-government Aksam daily. Aksam said the Russian ambassador was killed by a police officer who attended a university preparation course affiliated with the Gülen movement. Pro-government journalists also accused the US and the Gulen movement of the murder of the Russian ambassador. “The US, which let the rule of the world slip from its hands, is committing suicide attacks through the hands of terror organizations in many countries. Turkey is in first place. They will not manage to do this,” wrote pro-government journalist Fatih Tezcan from his Twitter account on Tuesday. Another pro-government journalist, ?brahim Karagül, wrote from his Twitter account that the murder of the Russian ambassador would inflict damage not on Turkish-Russian relations but on Turkish-US relations. “Pro-FETÖ assassination teams have been activated. CIA intelligence games have begun. Sleeper cells have woken up. Turkey and Russia are open targets,” he wrote. According to pro-government journalist Ömer Turan, the aim of Monday’s assassination was to prevent rapprochement between Turkey and Russia. “I have been making a big effort for months to explain that ‘deep’ NATO will do its best to prevent this,” wrote Turan from his Twitter account on Tuesday. Turkish-Russian relations collapsed in November 2015 when Turkey downed a Russian jet when it violated Turkish airspace. However, over 2016, there has been tangible an improvement in relations as Turkey has been seeking to pivot away from a European sphere of influence and cozy up to Putin. In an attempt to repair the damage both Erdogan and Putin made statements that yesterday’s attack was an attempt to damage relations between the two countries and to sabotage the ongoing Syria peace process.